Josie Song Handmade: Handmade flowers! Oh I how love browsing Anthropologie.com and their fabulous jewelry section! My search for cute flowers was a failure so I decided to take matters into my own hands--handmake them!!! 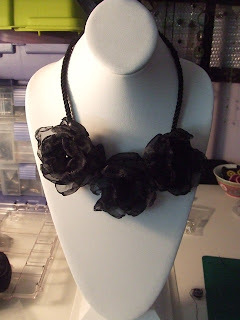 So here is the first experiment: black organza flowers sewn on to black nylon cord.